Category Archives: Welcome to the KYC Website. June 2, 2014 Welcome to the KYC Website. 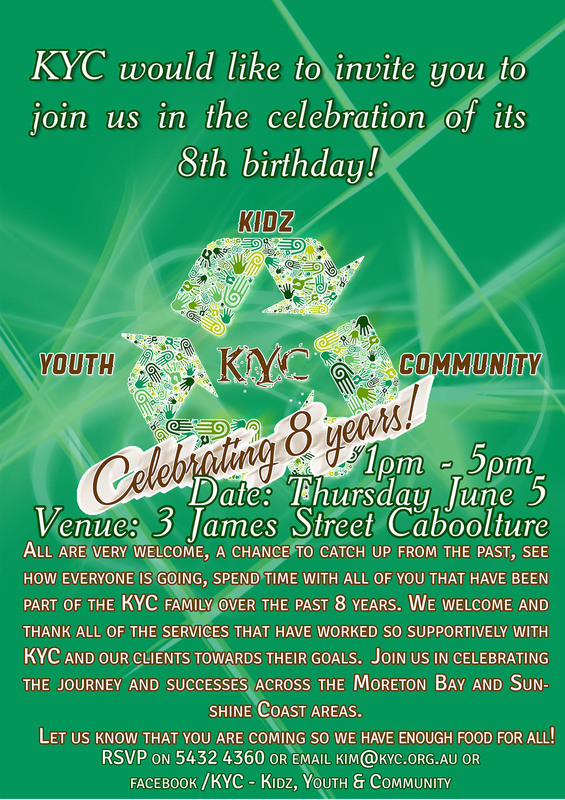 KYC will be celebrating their 8th Birthday this Thursday. We’d love to see everyone there from the KYC family both past and present to share the afternoon with and the services we’ve worked with throughout the years. Please RSVP by calling KYC on 5432 4360 or visit us on Facebook as soon as possible so we make sure there is enough food for everyone AND enough cake! It is from 1 – 5pm at 3 James Street, Caboolture on Thursday the 5th of June. Click to view the poster. February 12, 2014 Welcome to the KYC Website. Due to an overwhelming amount of spam coming through this site we’ve decided to disable comments on all pages including posts. At this time we cannot say whether this will be temporary or permanent (we don’t see people trying to scam or sell us supplements and other enhancement products ending any time soon) therefore if you need to get in contact with us please do so by referring here. November 14, 2013 Welcome to the KYC Website. Christmas is fast approaching again, can you believe it? Well, that means the annual KYC get together to celebrate the year coming to a close with the community. If you can get down to 3 James Street on December 12 from 4-6pm everyone is welcome to come and we look forward to seeing you there. R.S.V.P by November 29 please either by email Kim, kim@kyc.org.au or contacting a member of staff on 5428 3589. September 25, 2013 Welcome to the KYC Website. Just a quick update everybody….. KYC has moved into it’s new home and is located at 3 James Street in Caboolture and soon the New & Pre-loved Charity shop will be opening its doors which are located at Unit 4+6 Murrumba Arcade in King Street Caboolture. Thank you to everyone who turned up yesterday to our open day; we believe it could open avenues to a lot of positive outcomes that can only benefit our great regions. March 21, 2013 Welcome to the KYC Website. It was great to see everyone at the launch tonight. A huge thank you to Tom Rock HC Hip Hop and Transit Lounge for their contribution to making this music video possible and to all those involved in the video, you did an amazing job. Please everyone go on YouTube and support these artists by liking their video, sharing the link with others on your social media networks and spread the word around that Caboolture’s got amazing talent! Again, thank you for all who came, it was great to see you, those that couldn’t be there, you were missed. March 10, 2013 Welcome to the KYC Website. On March 21st you’re invited to join us in celebrating the launch of 2 music videos by some of our talented young people. It starts at 3 – 5pm with a BBQ and a catch up for the KYC family. All are welcome to join to celebrate with us so mark it in your calendars and we look foward to seeing you there! Welcome to the new KYC website. Look around and we hope you enjoy the site and what’s happening. We welcome your feedback and interactions towards living in our great communities.